Though marketers are still using social media to influence purchase decisions and drive sales, getting consumers to actually complete a purchase while on a social property is no longer a top priority for most. In 2017, 70.7% of US internet users will use social networks—time spent among adult users will average 1 hour,15 minutes per day. It’s a popular channel, and marketers are showing no signs of stopping efforts to reach shoppers there. 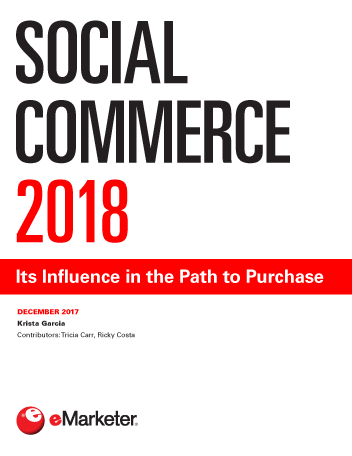 Shoppers aren’t flocking to social platforms to buy, but social media plays an important role in the early phases along the path to purchase, as a research tool and general influence. In a 2017 PwC global report, online buyers cited social networks as the digital media most used for purchase inspiration. New iterations of social commerce continue to evolve. Retail-friendly ad products and features from the major social platforms are constantly being introduced, influencer marketing is still a popular tactic, and visual commerce, including video, is becoming more influential on purchase behavior. Facebook is by far the most popular social media platform for researching, influence and buying, but Instagram is gaining ground. Younger social media users are more inclined to participate in this activity. "Roughly one-third of US social media users have never bought directly from social media, but close to half have done so via Facebook, either directly through a post or through a link in a post."